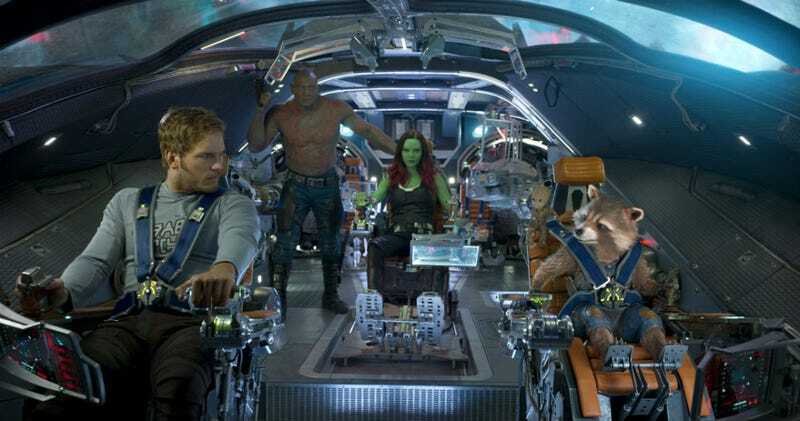 Marvel movies are known for their teasing mid- and post-credits scenes, but with Guardians of the Galaxy Vol. 2, they up the ante with five of them after the conclusion of the movie. Some are jokes, but some have huge ramifications for future Marvel movies. Here’s how and why. After helping the Guardians and losing his mentor Yondu, we see the Ravager Kraglin (Sean Gunn) on the Guardians’ ship, practicing with Yondu’s fin and arrow. He’s not very good at it but he does get the arrow moving... right into Drax’s throat. Drax will be fine, don’t you worry, but obviously the implication here is that, like Mantis, Kraglin could join the team moving ahead. Does that mean he’ll be with them in Infinity War? More likely he’ll be part of Guardians of the Galaxy Vol. 3. Various characters reunite at the funeral of Yondu, including three of the movie’s key cameos. We see Stakar—a.k.a. Starhawk in the comics—played by Sylvester Stallone, Ving Rhames as Charlie-27, Michelle Yeoh as Aleta Ogord, Krugar, and Mainframe (voiced by Miley Cyrus, if you can believe it). Yes, this is basically a reunion of Marvel’s original Guardians of the Galaxy team, from the late ‘60s/early ‘70s, and odds are they are going to play a part in Guardians of the Galaxy Vol. 3. Since the very first announcement of a Guardians of the Galaxy movie, fans have been asking when other famous cosmic Marvel characters would appear. We still don’t know about Nova, but now we know about the powerful Adam Warlock. The scene shows Sovereign leader Ayesha (seen above), still mad at her defeat at the hands of the Guardians, with a giant pod. She claims her greatest creation is inside... and she’ll name him “Adam.” This is a clear call-out to Adam Warlock, whose origins in the comics as an entity called “Him” ties into Ayesha’s backstory there, too, where she was originally an artificially created superbeing like Adam. Guardians of the Galaxy Vol. 2 takes place only a few months after part one, so Groot is still very small. In this tag scene, however, we see that more time has passed and Groot is now an annoying teenager, with Star-Lord almost acting as his father. So we can expect Groot to be at least this size in Infinity War, or, more likely, having continued to grow back into his full, original size. 5) The Stan Lee Theory Confirmed? The final credits scene in Guardians of the Galaxy Vol. 2 features a callback to earlier in the movie. We once again see Stan Lee in space talking to several large-headed characters comics fans know as a powerful alien race called the Watchers. Lee mentions his cameo as a delivery man in Captain America: Civil War, dropping the potential suggestion that Lee’s character who has cameoed in every Marvel movie, has always been the same person—or maybe even a Watcher himself. It’s been a long-running fan joke/theory to tie the comics luminary’s various movie cameos together. James Gunn may have just made it canon.